Anti-communist sentiment in Indonesia during the Cold War resulted in purges and massacres. As a densely populated, diverse collection of cultures, land masses and people, Indonesia’s collective identity is something that has been fashioned and moulded by its expansive history. Of this, the more recent Thirtieth of September movement and the anti-communist killings of 1965-66 that followed invite provoked further research and analysis into how its effects are still felt and perceived inpresent-day Indonesia. Propaganda played a big role in manipulating public opinion and prejudice, the messages of which are still prominent as the highly-skewed and violent films were mandatory showing in classrooms during Suharto’s control. (Cribb, 2015) This fuelled the anti-communist sentiment that underpinned the massacres, as the orders were executed by the military and civilian groups who trained under them. Even today, the genocide is not acknowledged with the respect and honesty owed to its victims, and much of the media or events that attempt to address it are met with censorship. The current Indonesian government has taken minimal responsibility for its bloody origins and gone so far as to prevent cinemas from showing the film, and crackdown on private screenings. (Pamuntjak, 2015) The lack of openness and transparency surrounding one of the worst breaches of human rights in the 20th century makes it confusing and difficult for Indonesians to make sense of their own history and collective national identity. Adam, A. W. 2015, ‘How Indonesia’s 1965-1966 anti-communist purge remade a nation and the world’, The Conversation, 1 October, viewed 6 December 2017, <https://theconversation.com/how-indonesias-1965-1966-anti-communist-purge-remade-a-nation-and-the-world-48243>. Associated Press Jakarta, 2017, ‘Files reveal US had detailed knowledge of Indonesia’s anti-communist purge’, The Guardian, 18 October, viewed 7 December 2017, <https://www.theguardian.com/world/2017/oct/17/indonesia-anti-communist-killings-us-declassified-files>. Cribb, R. 2015, ‘Behind the coup that backfired: the demise of Indonesia’s Communist Party’, The Conversation, 30 September, viewed 7 December 2017, <https://theconversation.com/behind-the-coup-that-backfired-the-demise-of-indonesias-communist-party-47640>. Hawley, S. 2016, ‘Australia, UK, US all complicit in Indonesian massacres, Indonesian judges say’, ABC News, 21 July, viewed 7 December 2017, <http://www.abc.net.au/news/2016-07-21/1965-indonesian-mass-killings-were-crimes-against-humanity/7647274>. Pamuntjak, L. 2015, ‘Censorship is returning to Indonesia in the name of the 1965 purges’, The Guardian, 27 October, viewed 7 December 2017, <https://www.theguardian.com/world/commentisfree/2015/oct/27/censorship-is-returning-to-indonesia-in-the-name-of-the-1965-purges>. Pohlman, A. 2014, ‘Incitement to genocide against a political group: the communist killings in Indonesia’, Portal, Vol. 11, no. 1, pp. 1-22. Roosa, J. 2016, ‘The state of knowledge about an open secret: Indonesia’s mass disappearances of 1965-66’, The Journal of Asian Studies, Vol. 75, no. 2, pp. 281-297. Suwandi, I. 2015, ‘No reconciliation without truth: an interview with Tan Swie Ling on the 1965 mass killings in Indonesia’, Monthly Review, Vol. 67, no. 7, pp. 14-30. 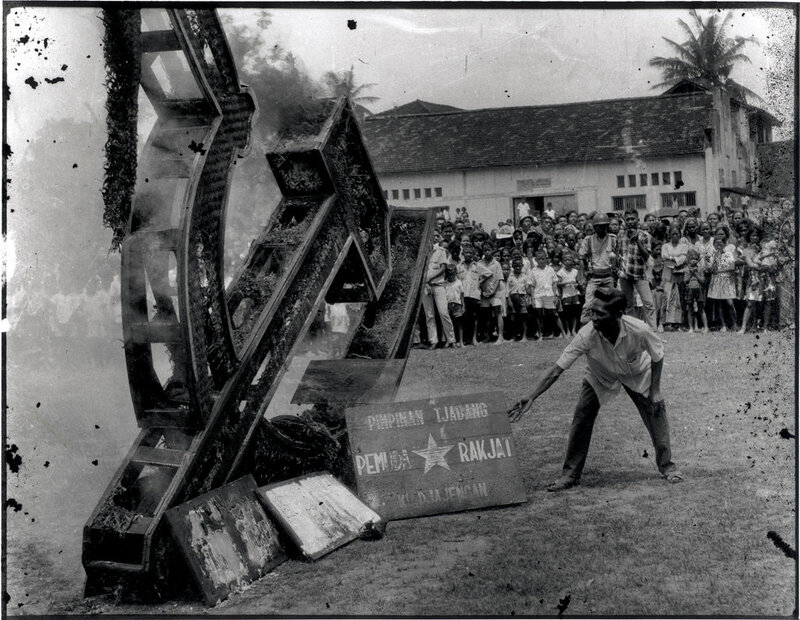 W. Surtarto, 1965, ‘Burning of hammer and sickle’, photography, viewed 8 December 2017, < http://www.nytimes.com/2012/01/19/world/asia/veil-of-silence-lifted-in-indonesia.html>. Interesting to get an insight into Indonesia’s complex history with communism, however it is very sad to read about the crimes against humanity that occurred under anti-communist sentiments. It’s even sadder realise that we still can’t grasp the enormity of the events that occurred nor have the full truth provided to the public to allow the process of healing to begin. this dark history that the government are trying so hard to conceal is so fascinating. it sounds so complex and like it must still come to the fore and the crimes against humanity acknowledged before a the wounds can begin to heal.